Dubai, UAE, December 04, 2018: November was a very impactful month for Green Hope. We were honoured to be a part of the Parliament of the World's Religions which took place in Toronto. I had the privilege of speaking at two panels--one on the Earth Charter and the other on Elimination of Nuclear Weapons. Green Hope was in Helsinki , Finland, this month where we won the Innovator of the Year Award from 100 amazing innovations globally for our work on using Education for Sustainable Development as a transformative tool to empower children and youth. I was also invited to speak at the closing ceremony of the Helsinki Education Week where I shared Green Hope's work with the Principals, Educators and teachers of Helsinki and the global innovators. We were also blessed to meet Nobel Laureate Archbishop Desmond Tutu in Cape Town, South Africa, during the 2018 International Children's Peace Prize ceremony. His words of inspiration will motivate us to work harder and make a difference. We also planted trees and interacted with the school children in Cape Town. 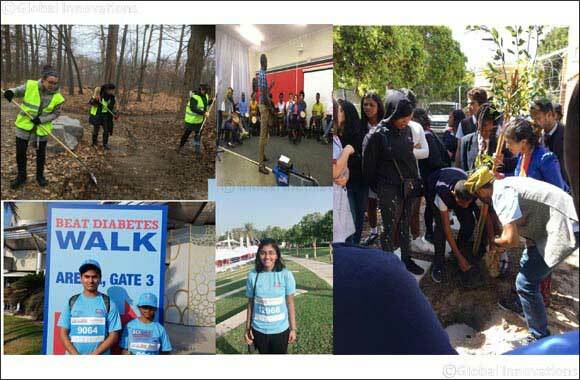 Green Hope participated in the Diabetes Walk in Dubai and conducted a trail cleanup in Toronto. 2018 is coming to an end. We need to pledge to work harder and make 2019 a cleaner, greener and more peaceful year.